Afghanistan. Carrots appeared in Europe around the 12th century and were likely in rainbow colors of reds, yellows and oranges. The culinary cousins of carrots include celery, parsley, parsnip, fennel, dill, and cumin to name a few…all in the Apiaceae family. Carrots also come in colors other than orange – ‘Purple Haze,’ ‘White Satin’ and ‘Red Samurai,’ for example. Companion plants for carrots include English peas, lettuce, the onion family, sage and tomato. Grow carrots in full sun and in loose, well-worked soil. Ideal soil for carrots is fine textured and free of clods and stones; work in compost to lighten and enrich the soil. To plant, sow carrots lightly in rows at least one foot apart and cover seed with no more than a half-inch of soil. Carrot seeds are tiny. One trick used by many gardeners to not overplant small seeds is to mix seed with sand or cornmeal…when you grab a pinch to sprinkle, it spreads out the seeds dropped into the ground. Be patient - carrots are very slow to germinate and can take up to 14 days to sprout. Keep soil moist during this period and don’t let the soil crust over. A row cover will help with keeping the soil moist during the germination time. For successive plantings, sow seeds when the previous planting is up and growing. important for straight and not deformed carrots. 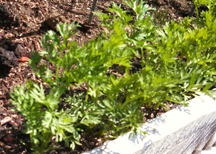 Carrots like even soil moisture; consistent water is crucial for good growth and color. Cover the shoulders of the young carrots with extra soil or mulch to prevent ‘bitter’ green shoulders. Avoid using high-nitrogen fertilizers which will only encourage lush green tops. lift gently if the soil is moist. Begin harvesting when carrots reach finger size. In mild weather – as much of Sonoma County experiences during the fall and winter – carrots can be stored in the ground and dug when needed. Mulch well if you live in an area where the ground does not freeze and you are over-wintering carrots. After being washed and topped, carrots can be stored in the refrigerator in a perforated plastic bag for a few months. Carrots are low in calories and high in Vitamin A. They can be eaten raw or cooked...steamed, boiled, roasted or sautéed. If you grow purple varieties, roast them so they don’t lose their purple color…as will happen if boiled. Raw carrots are a great lunch-box snack for your children. Carrots can be dipped or added to fresh salads, and young tops can be used to flavor soups. Enjoy!